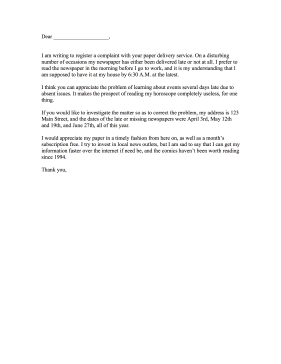 Paper delivery problems are addressed in this newspaper complaint letter. I am writing to register a complaint with your paper delivery service. On a disturbing number of occasions my newspaper has either been delivered late or not at all. I prefer to read the newspaper in the morning before I go to work, and it is my understanding that I am supposed to have it at my house by 6:30 A.M. at the latest. I think you can appreciate the problem of learning about events several days late due to absent issues. It makes the prospect of reading my horoscope completely useless, for one thing. If you would like to investigate the matter so as to correct the problem, my address is 123 Main Street, and the dates of the late or missing newspapers were April 3rd, May 12th and 19th, and June 27th, all of this year. I would appreciate my paper in a timely fashion from here on, as well as a month's subscription free. I try to invest in local news outlets, but I am sad to say that I can get my information faster over the internet if need be, and the comics haven't been worth reading since 1994.